We got underway just before 0900 on Tuesday, 10-July under sunny skies and with air temps in the low 80’s. 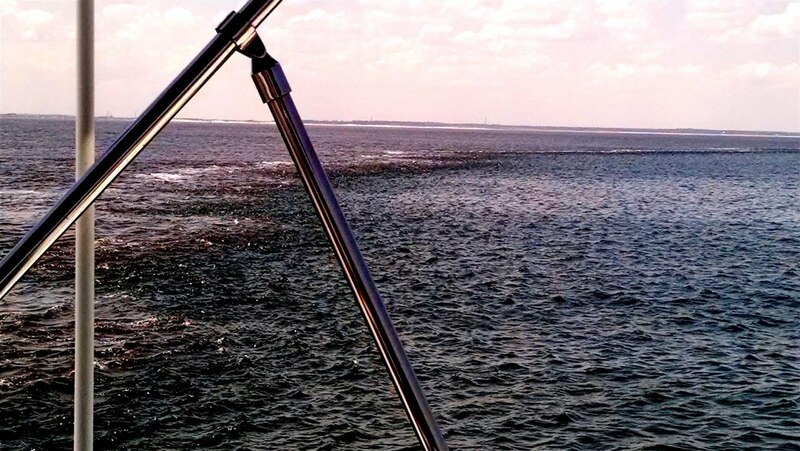 Egress through the St. Augustine inlet turned out to be a bit dicey….the charts aren’t marked at all in that area, and for good reason – the bottom in the so-called channel is constantly shifting and shoaling, so they don’t bother with permanent markers. Can buoys are used to mark the best path, but when heading directly east into the sun those things are not easily seen, even with binoculars. The current was also ripping on the outbound tide. We managed to pick our way through it, but you wouldn’t want to try it in any kind of other limited visibility – it is definitely a VFR operation. We were very happy to get out into the open Atlantic and deep water about 30 minutes later. The seas were as forecast, with long period and gentle swells from the northeast, initially at three to four feet, then gradually diminishing to a bit less. The big intervals made for a very pleasant ride. As we cruised past Jacksonville and the mouth of the St. John’s River we noticed the water color turn a murky brown – even four miles offshore the outflow of the river was very noticeable. A few miles north of there we encountered a distinct rip line and a color change back to the more pleasing blues of the Atlantic. At about that same time the winds also picked up noticeably, stirring to around 10-15 knots from the east with a scattering of whitecaps to go with it. Nevertheless the wind chop was quite mild on top of the long, slow swells, so it was still a good ride. Around 1600 we entered the long but well-marked and deep St. Mary’s Channel with a three knot pushing current accompanying the incoming tide (which swings about seven feet in this area.) 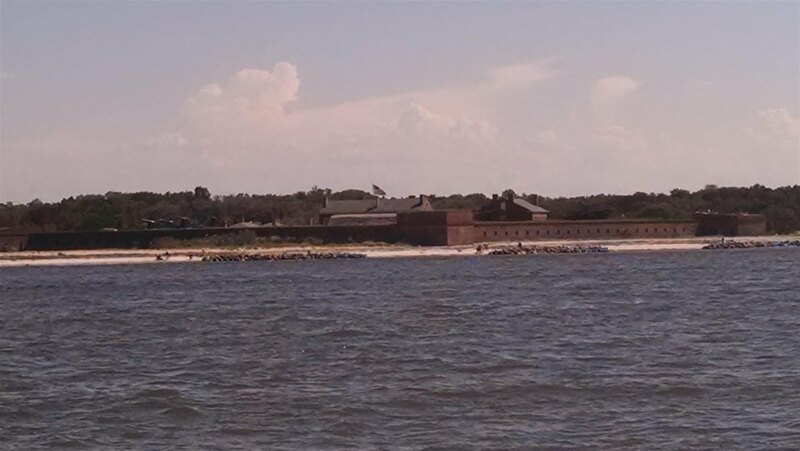 One of the primary landmarks you pass as you enter here is Fort Clinch, originally a Confederate stronghold at the beginning of the Civil War, but which later became a Union stronghold during the bulk of that conflict. 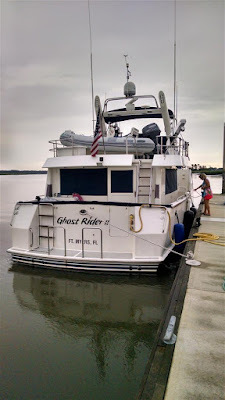 Chelle was manning the helm from the fly bridge and she surfed Ghost Rider down the strong current to steer us to the inside, then turned us north about three miles to tuck in behind Cumberland Island. We entered the wide, deep anchorage there slowly, but without issues. We dropped the hook in about 15 feet of water (actually lowered it with the windlass this time, as the free-fall clutch seemed to be frozen….our punch list never seems to get shorter.) But the anchor set on the first try once again, and we had a peaceful night at anchor. We ran the generator and A/C until morning as it was hot, but the breeze up on the fly bridge was quite pleasant. And we were no longer in Florida. 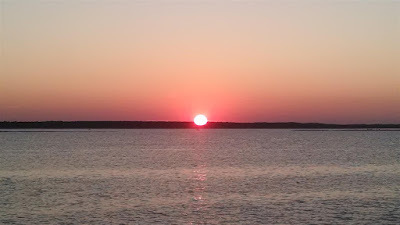 The next day, Wednesday, 11-July, we had a lazy morning on the boat catching up with a few chores, but around noon we launched the dinghy and motored over to the small public dock at Cumberland Island. Cumberland is a barrier island on the far southern coast of Georgia and is now an uninhabited national park, with the St. Mary River on its west side and the Atlantic Ocean on its eastern shoreline. The south end of the island where we went exploring is known mostly for its nature trails, wild horses and as the former site of the Carnegie winter mansion. Actually the ruins of that mansion still stand, and while deprecated quite a bit (it burned in 1959), it’s obvious the place was huge at one time. We walked for nearly three hours touring the area (in 95 degree heat) and enjoyed another history lesson, while avoiding the occasionally rambunctious horse. 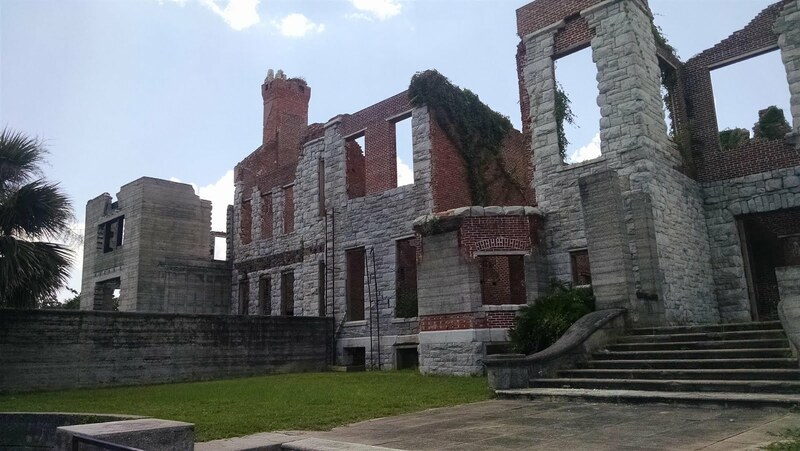 Before the Carnegie family purchased and further built it up in the 1880’s, the land was previously occupied at different times by native American Indians, Spaniards, the British, slave refugees, and Nathaniel Greene (a Revolutionary War hero.) There are whole books written about this area. By the time we had dinghied back to the boat we were definitely ready for the modern convenience of air conditioning and some fruity rum drinks. We slept in the next morning since we had a relatively short sortie planned, getting back underway around 1000 on Thursday, 12-July. It didn’t turn out to be one of our better days on the water. First off the hydraulic leak returned after the new o-ring blew out as we retrieved the anchor, spraying the aft part of the engine room with copious amounts of hydraulic fluid. Rick spent the next three hours down there while we were underway, cleaning up and experimenting with various o-ring sizes and torque adjustments before we finally found a sweet spot that allowed thruster and windlass operations without too much leakage. But we didn’t have a lot of confidence about how long this next repair would last, so we decided to proceed cautiously. Thus, after we had traversed the channel into St. Simon’s sound and approached our anchorage, we paused and did a thorough leak check while running the hydraulics under stress – both bow and stern thrusters, as well as the windlass, at high RPM. That exercise revealed the new o-ring (smaller than the previous and original ones) was holding its own, so we proceeded to the anchor site and dropped the hook. That’s when things got uglier. We could not get the anchor to take a set, which is rarely an issue for our ground tackle, and by that time the wind and current had also picked up considerably. We found ourselves drifting back at a high rate of speed and it took considerable effort to get the boat stopped before it would drift into a nearby sailboat. We recovered in time, but as we retrieved the chain while moving forward to prepare for a second attempt, we discovered why we could not get the anchor to take hold – it had been gored by a 15 foot long railroad tie, right through its balancing rollbar. While our anchor weighs in at 100 pounds, that chunk of water-logged and creosote-soaked piece of wood probably weighed another 400 pounds. We would never get it to grab the bottom in such a configuration; the only good news was the damned thing wasn’t still attached to a railroad track. 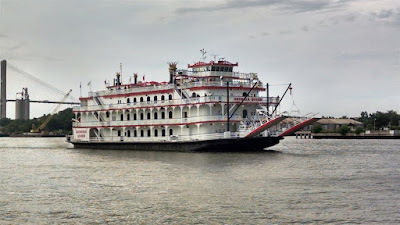 Now we had this humongous hood ornament dangling from the bow, making anchoring impossible and docking at the nearby marina a dicey proposition at best. 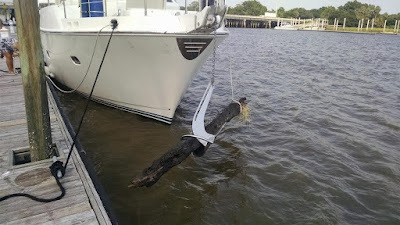 While Rick hung over the how attempting to dislodge the timber, Chelle made a call to BoatUS, who suggested all they could do was cut the anchor chain. We passed on that. The sailboat captain dinghied over to us and helped attach a line to the longer end of the railroad tie, which we then tied off to a forward bow cleat to stabilize the swinging anchor and lumber. We then lowered that mess back into the water to try and break it loose again, with zero effect. 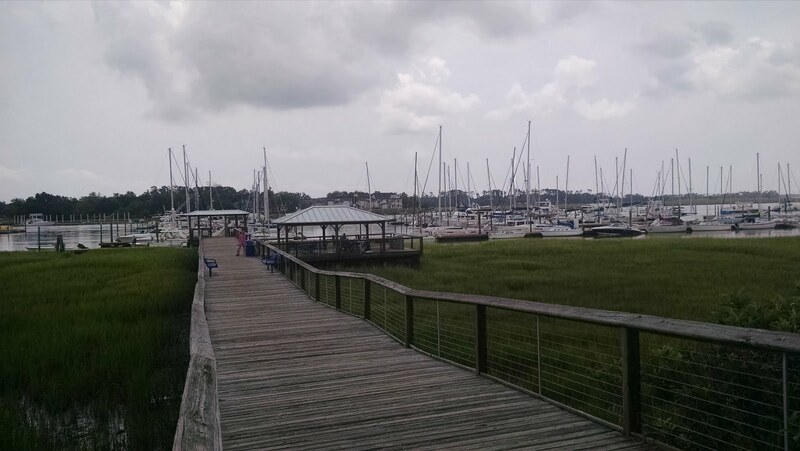 So we called the nearby Morningside Marina and asked for an alongside tie on their outer docks and they were able to accommodate. 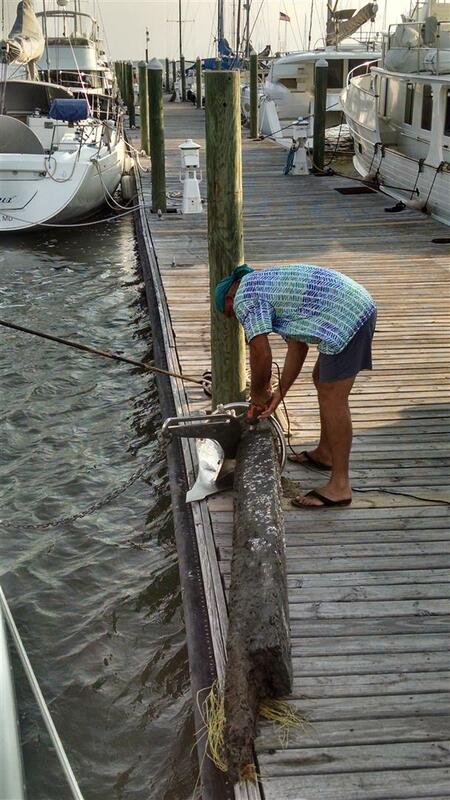 We had to approach slowly and at a shallow angle in the zipping current to avoid damaging our hull or their docks with the swinging mass on the bow, but we pulled it off, finally tying up at the marina’s fuel dock at about 1700. It took two other guys plus Rick to haul the anchor and log up onto the dock, but the timber was still hopelessly lodged in the anchor’s rollbar. We finally decided we would wait and rent a chain saw the next morning, but about an hour later we heard a buzzing sound on the dock and walked out to find a fellow boater chewing away at the log with an electric hand saw. Rick joined in to help and after about another 20 minutes we had the thing sawed through enough to bust off part of it and were able to dislodge the big stick. Our Good Samaritan – Mike, a retired fire chief – said he likes helping fellow boaters. Bless him. We owe him a couple of new saw blades. After sleeping in again the next morning, the remainder of Friday, 13-July, was dedicated to recovering from and cleaning up the messes of the previous day. That included mopping up residual hydraulic fluid in the engine room and lazarette, hosing the salt off of Ghost Rider, and then several hours of only somewhat successful scrubbing to remove or at least reduce large splatters of mud and creosote stains from the foredeck, bow and anchor. After that we retrieved the anchor from the dock and parked it on the bow pulpit once again. Chelle took an e-bike ride into town to scout some places to tour the next day, but otherwise the evening was just socializing with dock neighbors and a quiet dinner aboard. That same evening we received a reminder of how minor our little incident had been….as a 45 foot cruiser entered the marina basin that boat lost power and steerage, and the strong current took it at a fairly quick pace down the fairway, whereupon its anchor and bow pulpit buried itself into the starboard side of a nice looking 55 foot Fleming. Now that’s a bad day. On Saturday, 14-July we were just tourists, hopping a short Uber ride over to St. Simons Island and taking a guided tour that lasted most of the afternoon, and reacquainted ourselves with the rich history associated with this unique geography. Not too surprisingly, that historical narrative is related to that of the eastern coast of northern Florida, as it encompasses the areas contested by Britain and Spain over the centuries leading up to the American Revolution. 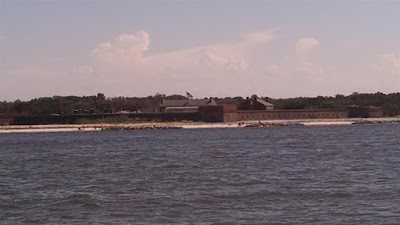 Eventually the Spaniards realized that trying to dislodge the Brits in the summer heat and humidity that goes with these barrier islands was futile, even with numerical superiority. American colonialists eventually took control, after which it became one of the many Civil War battlegrounds along the eastern seaboard. It was here that General William Tecumseh Sherman ended his “march to the sea” (before he veered to the north) that slashed, burned and ultimately destroyed the Confederate capacity to wage war. We enjoyed an early dinner in the charming town square at Iguana’s – the place to get healthy helpings of delicious Wild Georgia shrimp – and returned to the boat for a pleasant happy hour and cocktails with Laurie and Mike (our Good Samaritan.) We turned in early as we knew we had a long sortie the next day. The next morning dawned with a light shroud of fog that coated the boat with a thick layer of dew. But as we pulled away from the dock at 0750 on Sunday, 15-July, the sun had burned off most of the gloom and we had good visibility in the channel leading back out into the Atlantic. That was a good thing as we found ourselves dodging a few floating logs while punching into a serious current (the tidal range here is around eight feet) for the first hour or so. After finally exiting the long channel and getting the bow pointed northeast again, we found very pleasant sea conditions with widely spaced two-to-three foot swells. Winds were around 10 knots from the east, and broken cloud cover kept air temperature in the mid 80’s most of the day. Midway through the sortie the skies began to clear, warming the temps a bit, and the swell laid down giving way to a short two foot chop which still yielded a very comfortable ride. Rick chose to futz with packing gland a bit more as he wasn’t happy with the its hovering in the upper end of the acceptable temperature window, and later in the day had it back to his preferred ambient +25F. 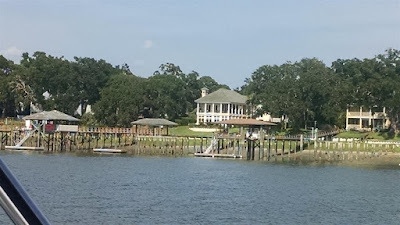 As we neared the entrance to the channel formed by the Wilmington River, which would eventually lead us to the Thunderbolt Marina and the Savannah area, we encountered a widespread debris field of tree limbs, an occasional log, and all sorts of other floating detritus. At the same time the depths shallowed to less than five feet under the keel. And this was nearly four miles offshore. But we managed evasive actions to thread our way through all that, although the channel still presented another 14 nautical miles and hefty tidal currents to navigate (eight foot tide swings here). But traffic was light and most of the channel was wide and deep. We pulled alongside Thunderbolt’s outer dock just after 1800 without incident, gave the boat and ourselves thorough washdowns, and called it a day. They Delivered Fresh Crispy Cream Donuts Each Morning! 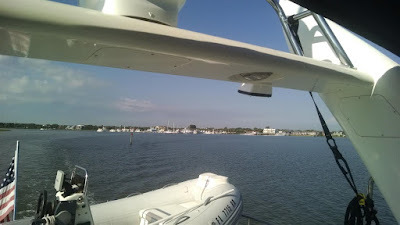 Monday, 16-July was mostly dedicated to boat business, some of it planned (routine maintenance and minor provisioning), some of it unplanned (that damned hydraulic leak, plus a new fuel pump line leak on the wing engine.) Rick called out a local diesel mechanic to help with the recurring hydraulic o-ring issue and the fuel pump issue, and also spent some time disassembling, lubricating and reassembling the windlass to solve the freefall clutch issue. 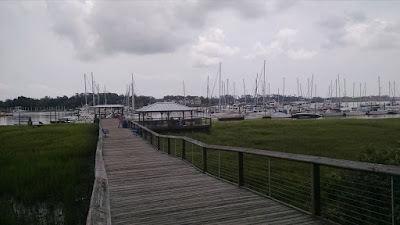 Chelle used the marina’s courtesy car to do some shopping and scouting for the next day’s plan of touring Savannah, so overall we were pleased with the day’s results. 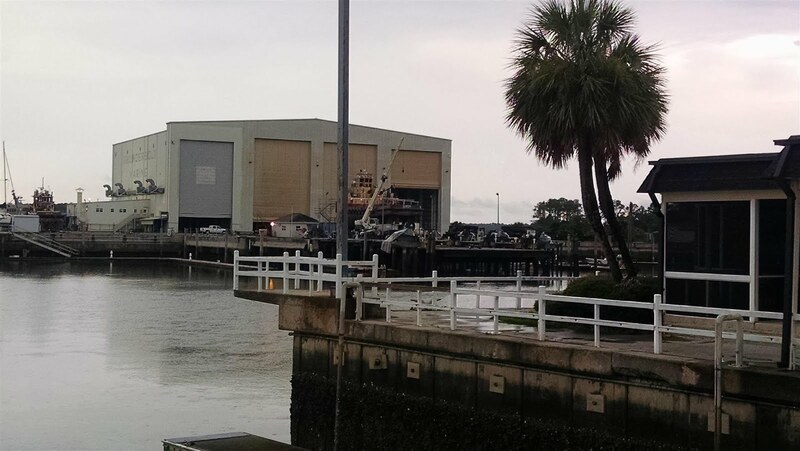 The next morning (Tuesday, 17-July) was about more boat business – but all routine stuff, including weather and routing checks for the following day’s planned sortie up to Edisto. We were also able engage a local diver to perform our preferred monthly below-the-waterline duties for Ghost Rider – checking the thruster blades, both props, all zinc anodes, and removing any scum or barnacles that had accumulated; since we'd also had some close encounters with one sandbar and a couple of logs, we also wanted assurance we hadn’t incurred any scars down there. The diver’s report was excellent. 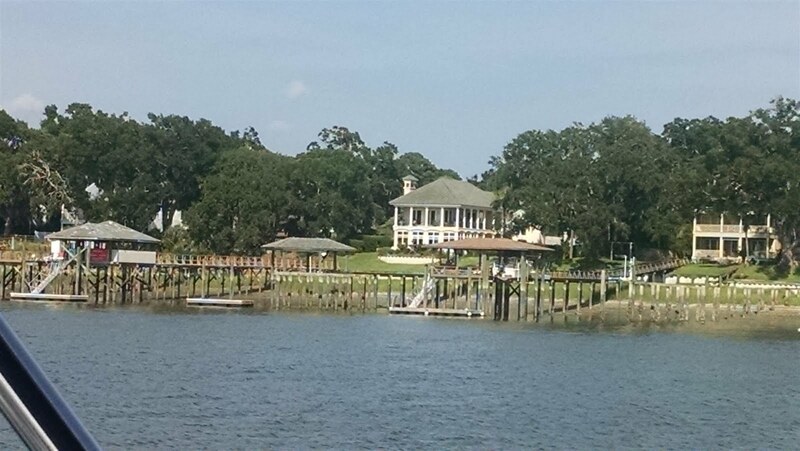 So that afternoon we both got away from the boat and toured the river and historic districts of Savannah. Our first stop was the City Market, which we decided was a good place to stop for a late lunch when a storm cell started dumping buckets of rain on us; the spiced baguettes and stuffed mushroom dishes were excellent, as were the unique south Georgia sangria's. 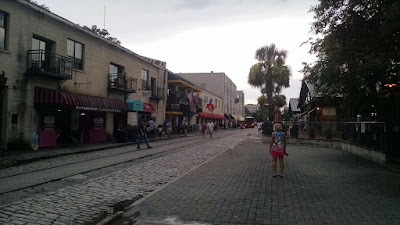 The rain passed quickly so then we took a stroll down the old riverfront area, which has been admirably preserved and restored with its centuries-old architecture and cobblestone streets, while providing plenty of pubs, restaurants, shops and open markets within easy walking distance. From there we hopped a tour trolley and took a narrated tour of the city’s old historic district. From the earliest days of its British settlement by General James Oglethorpe in 1733, to its colonial days when it flourished as a cotton and rice production center (meaning plantations and slavery), and then its embattled Revolutionary War days, much of the city’s layout and original structures have been preserved. That’s at least partially due to the fact that when General Sherman marched his Union army up here from south Georgia during the Civil War, he was so impressed by its charm and beauty that he decided not to destroy it; instead he wired President Lincoln and General Grant in late December of 1864 and offered the intact city of Savannah as a Christmas present. 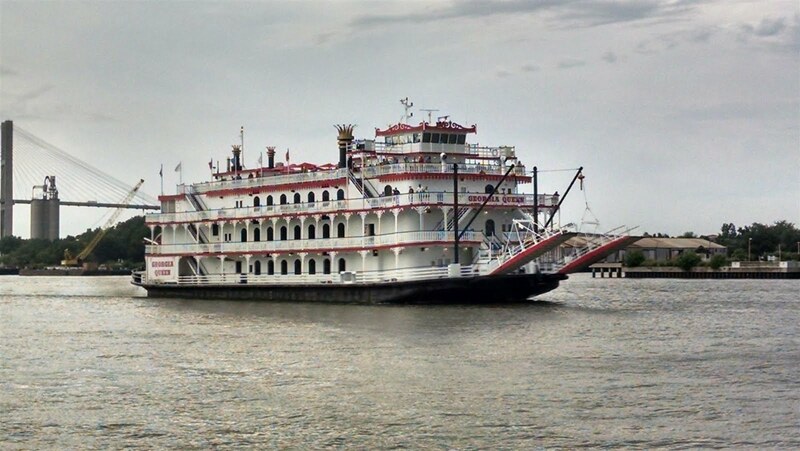 Savannah had its ups and downs from then until WWII, but has recently flourished again not only as a tourist destination, but also as a bustling seaport, now one of the busiest in the United States. 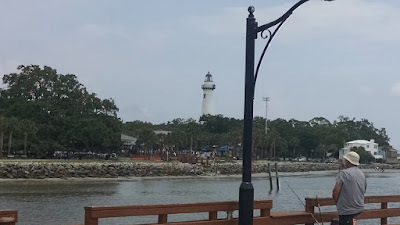 It has also been a popular spot for movie-makers – famous scene spots from “Forrest Gump” and “Midnight in the Garden of Good and Evil” are among the interesting stops on the trolley tour. We were pretty much spent by early evening and returned to the boat for a light dinner and a good night’s sleep before the next day’s long sortie to the Edisto area. We're really looking forward to that stop and spending time with good friends Paul and DD. Well, TIde Pirate is making News again. Have never ever thought of getting a RR tie attached to my anchor. Love your news and glad you be having a great adventure. Look forward to the next update.